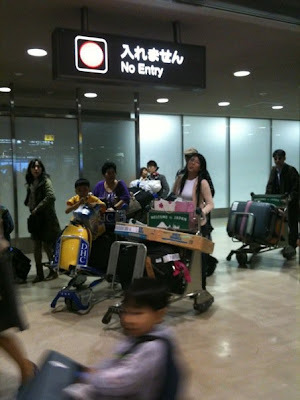 Upon arrival at the Narita International Airport, it took us quite a long walk from the plane to the Immigration. There was quite a long line 'coz our plane's really full...maybe because there were lots of tourists who would spend their summer vacation in Japan too. At the Immigration, we were directed to the priority lane by a ground attendant. There we were attended by a female immigration officer. My grandma and I had our thumbmarks and photos taken, and our passports stamped. Then we proceeded to get our baggage at the conveyors. While when on our way to the Customs, we encountered a lot of officers with sign boards which had photos of fruits. I knew they were asking if we got fruits in our baggage, so I said "no/none". Then we submitted the form we filled out during our flight (regarding prohibited items/customs duties) at the Customs officer at the gate. Then we headed to the exit gates. Upon exit, we immediately saw my Uncle and cousin waiting for us. Yes, their waiting area's inside also, unlike in the Philippines. Then we proceeded to the parking lot. But before riding the car, we had to pay for the parking first. Daddy just inserted the parking ticket and the payment...then whoala! Done! It was totally freezing outside! I put on a thick jacket yet I still felt cold. It felt like I was in a huge freezer! Temperature was approximately 0 degrees...but it also turned negative along our way! Yay! We got a house in Tokyo, which is about an hour away from the airport, but we'll be staying at our house in Suwa CIty, Nagano, which is about 4 hours of travel via Express Way. On our way home, we passed by Tokyo and saw the Tokyo Tower. We grabbed some food at a service area along the Express Way. Then back on the road again. It was below 0 degrees Celsius outside! Thank God, there's a heater in the car. haha!